Here the mulch is applied about four feet in diameter. Marking the rows with a hoe first made digging the holes go faster. A couple of posts ago I discussed a hands-off style of flower gardening that works some in established gardens. In those cases the soil is usually in pretty good shape after having had plants growing in the same spot for many years. Not everyone is fortunate enough to have such a garden space. Sometimes the soil in a potential garden spot requires a lot of work before it is fit to grow vigorous plants. Take for example the case of the typical yard of a newly constructed home. It’s not unusual for the builder to remove the existing topsoil and haul it away to be sold. Then, usually, soil excavated for the basement is spread over the new yard area leaving the new homeowner to struggle with the poor soil. The homeowner often ends up buying topsoil (most likely from a different housing project) to add to the yard. New topsoil may be adequate to grow a lawn but not necessarily good enough to grow flower and vegetable plants. In that case, the laissez-faire method of gardening will have to be put on hold until the garden has built up fertility and the soil structure has improved. That may take years or decades without major help from the gardener. There’s a way to drastically improve a garden spot so it can be in tip-top shape the first year. It’s a method called “double digging”. Double digging is not for the faint of heart. I did it one time many years ago for a problem area and I can tell you it’s a heck of a lot of work but the results were impressive. I suggest starting with a small garden bed in case you run out of energy or patience before the project is done. 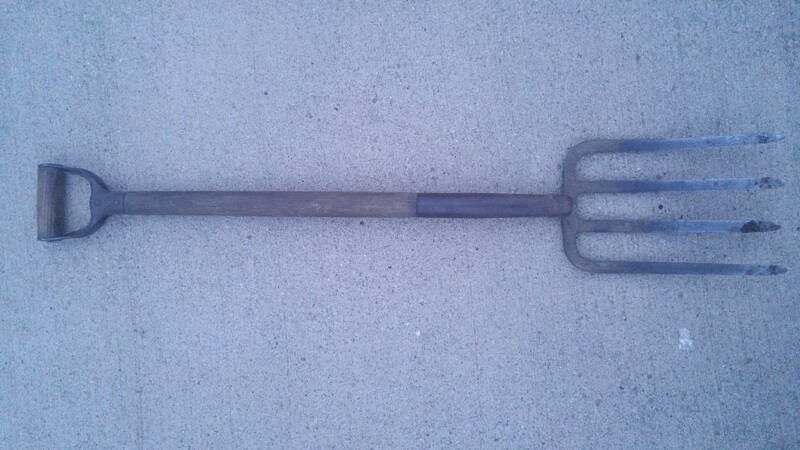 A sturdy garden fork is an essential tool for double digging and general garden work. Start by digging a trench about a foot wide and the depth of of your shovel along the entire lenght of one side of your new bed. Pile the soil from the trench along side your excavated area. 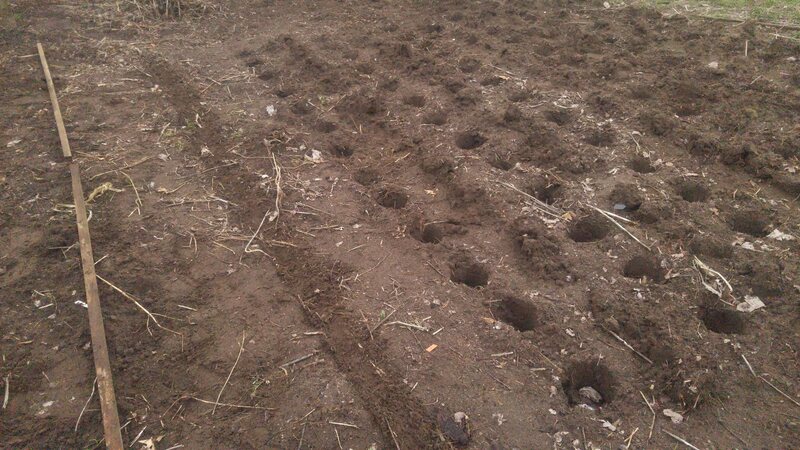 Then insert a garden fork into the soil of the bottom of the trench. 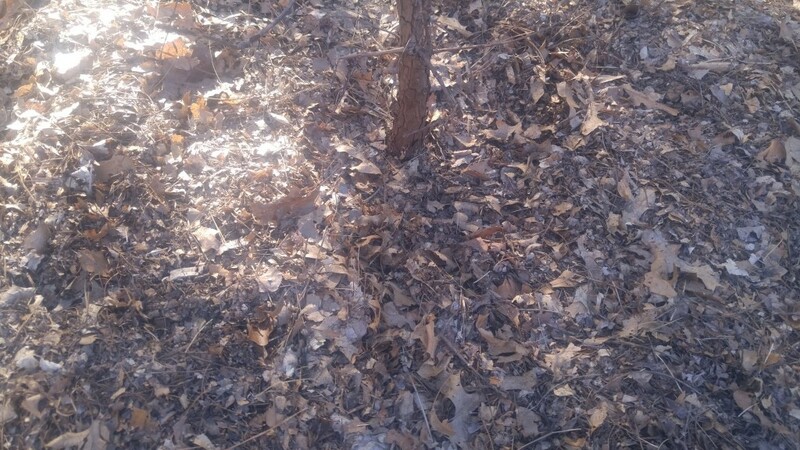 Use the tines to break up that layer of dirt and incorporate some compost as deep as you can. Dig another trench along your original trench, again over the entire length of that same side. Take the soil that you remove from digging your second trench and place it into your original excavation, right on top of the loose soil and compost. Once the second trench is done, dig another and another until you eventually reach the far side of the bed. Fill the final trench with the soil that you took out of your very first trench. The final step is to spread more compost over the entire garden bed and deeply dig it in to the soil with your garden fork. If you plan to add fertilizer, now would be the time. The soil will be fluffy and full of air-pockets so you’ll need to water the area a few times to help settle the soil before planting. In some gardens, double digging seem like over-kill but in certain circumstances it’s the ideal way to build a garden bed. You’ve read it here in this blog, you’ve heard it from your neighbor, even your Aunt Bootsie told you to get a soil test for your garden. I’ve always recommended using the soil testing lab at Michigan State University, it’s the “gold standard” of soil labs in Michigan. For most gardens a basic test will provide you with all the information you’ll need. In past blogs I’ve described how to properly take a soil sample for testing and what to do with it once you’ve collected it, so we won’t discuss that today. Instead we’ll look at actual soil test results. Once you’ve rounded up a bag of dirt, sent it to the lab along with your payment, the MSU soil lab will test your sample, processes the results and send you the test results either by email or by mail. That usually happens within ten days. Let’s take a peek at an actual soil test readout I received last fall. 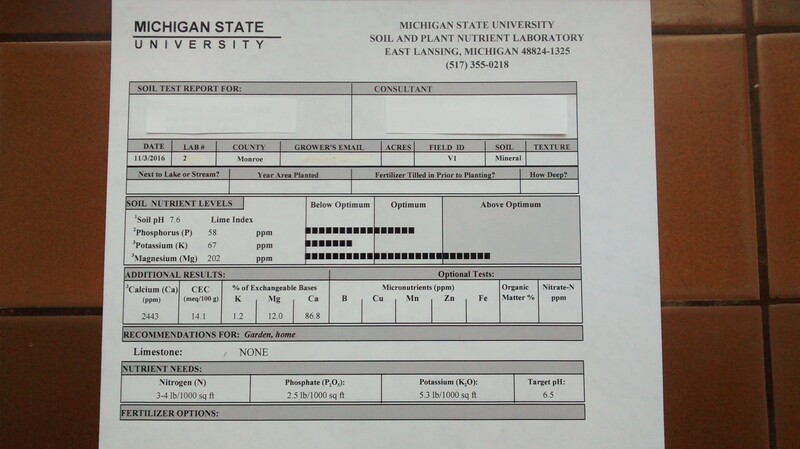 A basic soil test result readout. 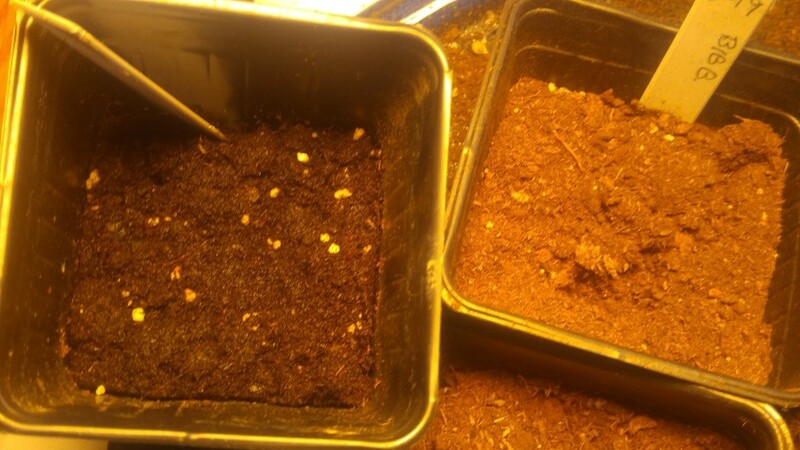 The first test result is the soil pH. pH describes how acid or how alkaline your soil is with “7″ being neural. In this case the sample result is 7.6 which is somewhat alkaline. So right away we know we won’t have to add any lime to raise the soil pH since most garden plants grow best in a slightly acidic soil. Next is the result for phosphorus, the “P” in NPK. The result came back at 58 ppm (parts per million) which, according to the graph is well in the optimum range. Following P we see that is the potassium (K) is 67 ppm which we see is below optimum. Magnesium (Mg) at 202 ppm is above the optimum range. Calcium(Ca), shown in the additional results section is 2443 ppm which helps to explain the relatively high soil pH reading since calcium will raise soil pH. The next result is CEC (cation exchange capacity) this tells us how well the soil is able to retain soil nutrients. A reading of 14.1 tells us we can add fertilizer to this garden without having it leach out of the soil. Usually, soil types with a higher percentage of clay in their make-up have a higher CEC and therefore are inherently more fertile because of all the retained nutrients. Very sandy soils have low CEC values. It is very difficult to change the CEC of a soil. On the other hand, we can easily raise the NPK values by simply adding fertilizer. Those cations (positive-charged ions) that are being described in the CEC reading are mostly K, Mg and Ca. There is a section in the readout providing the percentage of each of those. Phosphorus is not listed there because it exists in the soil as negatively charged anion (PO4 3-). Nitrogen (N) is not tested for at MSU because soil nitrogen levels change with the temperature and other variables so you would never get an accurate reading. We don’t have room here to discuss the soil science behind the results. Fortunately, the soil lab boils it all down to some simple recommendations at the bottom of the readout. The nutrient needs are listed as actual pounds of each element per 1000 square feet. Since fertilizer is not sold as pure nitrogen, phosphorus or potassium, the precise amount of any type of fertilizer must be mathematically calculated. Back in the olden days when I was an MSU Extension Agent and the results were printed with a dot-matrix printer, I made those calculations by hand on hundreds of test results. Nowadays MSU has an online calculator that you can use to figure out how many pounds of fertilizer you would need to apply. With the planting season rapidly approaching,I suggest you get your soil sample to the lab ASAP. Much like your income tax return; the sooner you send it in the sooner you’ll see your results.